Your wedding day at The Whitewater Hotel will be the most memorable day of your life AND we can make it stress free too! Our considerable experience coupled with our network of wedding services providers helps the bride & groom to plan for their special day. We have developed a “one-stop shop” package which will not only free you from the worry of covering every detail of the event, but give you the reassurance that you are hiring the best in the business to help you on the day. Our dedicated wedding planner is here to provide you with a truly personal service right from the start until we bid good bye as you leave us to start your new life! 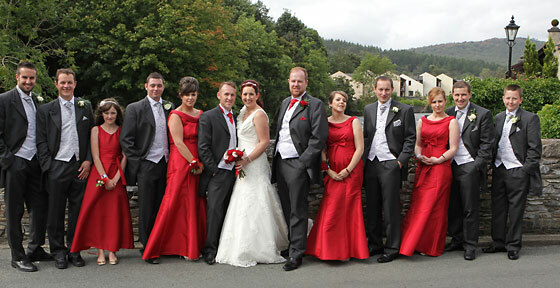 For your lake district wedding the Whitewater hotel is a highly desirable venue for your special day. Many couples come from far away to find their dream venue; local knowledge is often key in the early stages of planning your perfect day and that´s where we begin planning your journey. We have developed mutually beneficial relationships with local and regional suppliers of all types, not only wedding services. These suppliers fulfil the standards we require for our wedding arrangements. Obviously you may have your favourite suppliers and we respect that you might want to use them. In conjunction with planning your wedding you may wish to organise a ride on the steam train or take a cruise on Lake Windermere, we can arrange this and other local amenities for you too. Below we have listed potential services you may require for your celebration. These are, of course, in addition to the normal hotel services which you will be discussing with your designated and personal wedding planner. As a first stage, without obligation, please let us know if you have a date in mind by submitting this short form. We will be in touch soon after. If you wish we could arrange a day at the hotel for you to meet all of your potential suppliers and discuss your requirements. Alternatively we can do this for you after a discussion with yourself. In the meantime please download or have a look at our Wedding Brochure (2.9MB). Please note the Hotel is licensed for you to hold your wedding service in our Riverside Suite or weather permitting outside in our Gazebo, we will be pleased to help you arrange this.